…At the Theatre Academy V.Guyvoronsky taught musical improvisation to a special group, which became a basis for a quintet. This ensemble existed for 3 years and performed transcriptions of Partite and Choral Praeludiums by Bach, 3 songs by Bottiegari and a work to «Pigeon Book» ancient Russian text in a very strange instrumentation with, surprisingly, French and Chinese lyrics. 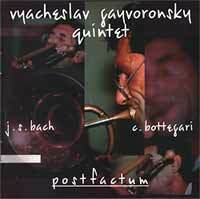 Parts of this program we re recorded for the «Postfactum» album (1998).